Flying Colors Video Slot Guide & Review - Casino Answers! Flying Colors is a 5-reel, 20-line video slot developed by Rival, featuring wild substitutes, scatter wins, a free spins feature with a multiplier and a bonus game. You can play the Flying Colors video slot at Bovada. When you start playing Flying Colors, can either play the default $0.01 coin size or raise it to $0.05, $0.10 or $0.25. You can then select the number of lines (up to 20) and number of coins (up to 10) you wish to bet per spin. The lowest total bet you can make per spin on the Flying Colors slot is $0.01. The highest total bet you can possibly make is $50 per spin. To play Flying Colors with all 20 lines active and 10 coins, hit the “Bet Max” button. Otherwise, use the “Spin” button to spin the reels. There is an autoplay mode for real money players only. The top jackpot on the Flying Colors slot is the Zeppelin symbol. It pays up to 10,000X your bet per line if you hit 5 of them on an active payline. The Zeppelin symbol substitutes for all symbols in Flying Colors except for the free spins scatter symbol. The highest paying non-wild symbol in the slot game is the Bomber Girls jackpot symbol, which pays 1000 coins for 5 symbols on an active payline. You can win the 10,000 coin top jackpot by playing at Bovada! 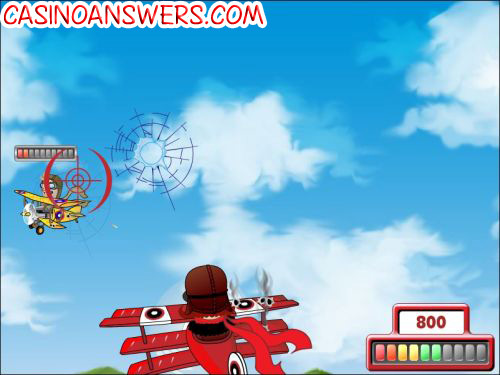 If you hit 3 Propeller symbols, you will win 7 Can’t Lose free spins (14 free spins for 4 symbols and 25 for 5 symbols). The first reel is wild so, each free spin is a guaranteed winning spin. All wins pay left to right, except for scatters (which pay any). All wins are multiplied by coins staked per line, except for scatters. Only the highest win is paid per selected payline. Flying Colors is an excellent video slot from Rival, due to its fun bonus game, guaranteed wins on all free spins and a high top jackpot. To get $1900 in slot bonuses along with a $20 free cash no deposit bonus to play Flying Colors as well as the iSlots at Rival online casinos, sign up and deposit now at Superior Casino! Are USA slots players able to play the Flying Colors casino game? Where can I play a Flash game of Flying Colours for free? 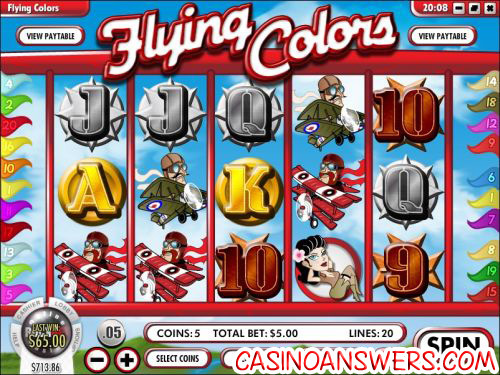 You can find an Instant Play Flash version of the Flying Colours video slot at both Superior Casino and Pantasia Casino. Mac players will have to play the Flash version, as there is no Mac casino client available for any Rival casino at this time. You can play for free or for real money. If you experience issues with the Flying Colors Flash game, download the latest version of Adobe Flash Player. Can I find any other military aircraft-themed video slots? Yes, you can read our Bomber Girls Video Slot Review or play the slot game at Lucky Emperor Casino. What rival casinos offer the plane slot machine game?